"The Fabric Of America". 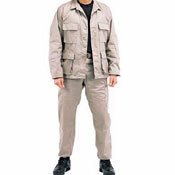 These BDU's are constructed of 100% made in the U.S.A fabric. Featuring top quality workmanship. Comes in either Poly/Cotton or 100% Cotton Rip-Stop. Top and bottom sold separately. The "Basic Issue" features reinforced elbows, seats and knees.